Homewood Health Centre is looking for an Addiction Physician to join our team. Homewood is a 300 bed Schedule 1 facility under the Ontario Mental Health Act and is composed of three distinct but integrated services (Regional Services, Addiction Medicine Services, and Psychiatry Services). We are seeking a dynamic and innovative Addiction Physician to work with our Addiction Medicine Services (AMS) team who is committed to the highest standards of addiction treatment, embraces collaboration, team work and who is passionate about our vision and values. The Addiction Medicine Service (AMS) is a 105 bed, inpatient, abstinence based program that follows a disease model of addiction and utilizes 12 Step facilitation, Cognitive Behavioural Therapy (CBT) and Motivational Interviewing (MI) in the treatment of individuals with a drug and/or alcohol addiction. Within the program, specialized programming is offered to Health Care Professionals, Young Adults, and Uniformed Professionals. We also offer groups to individuals struggling with co-occurring eating disorders, depression, and anxiety disorder. In addition to the Addiction Only Stream, a fully integrated Addiction-PTSD Stream is offered. The incumbent is responsible for clinical care of patients as they develop their unique abilities to attain the highest level of functioning. The position interacts with an inter-disciplinary team of nurses and other clinicians to provide excellence in patient care. Membership with the College of Physicians and Surgeons of Ontario (CPSO). Canadian College of Family Physicians designation. Experience and training in addiction medicine. Certification in addiction medicine preferred but not required. We are experts: Homewood is one of Canada's largest and leading facilities for medically focused, physician-led treatment of mental health and addiction disorders with over 130 years of experience. 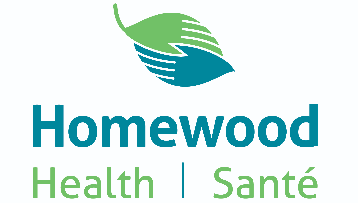 We are dedicated to improving lives: Homewood provides specialized and unique inpatient assessment and treatment with an expert inter-professional clinical team. We have a national network of the best clinicians and a comprehensive continuum of services. We are connected: Homewood Health Centre supports the residents of Guelph and Wellington County with essential acute mental health and addiction services. We are partners with the Homewood Research Institute for evidence-informed research to enhance practice, and we are a teaching hospital in collaboration with McMaster University. We are exceptional: Homewood Health Centre has been accredited with Exemplary Standing by Accreditation Canada. We are committed to quality: Homewood Health Centre is focused on delivering the best care possible and we promote a quality culture with our outcome studies and research. In the last year over 95% of patients informed us that their treatment at Homewood aided their recovery. You are excellent: You maintain excellence in practice and have high standards. You are open: You communicate honestly, striving for clarification and completeness of understanding, seeking input from those affected by decisions. You are collaborative: You work well in a team environment and are accessible and responsive to internal/external partners to improve the quality of services. You are solid: You build strong relationships and treat others with respect and honesty, and honour the unique value of each individual. You are efficient: You use resources (human, financial, capital and information) wisely to create a unique healing environment. You are open to learning: You are interested in continuous improvement and you encourage and support the exploration of innovative ideas and approaches to create ethically sound improvements in mental health services. Homewood thrives on our Employee Competency Model; a set of behaviors that drive performance in all our Homewood positions. All candidates should exemplify these behaviors that truly make a difference in performance including; Building Relationships, Managing Self, Living Our Values, and Driving Own Performance. At Homewood we improve life. As per the Ontario Human Rights Code and the Accessibility of Ontarians with Disabilities Act, Homewood Health Centre is committed to working in collaboration with any team member who may require a workplace accommodation in order to successfully perform any or all aspects of their role. Homewood Health Centre is pleased to foster an environment that helps create a safer, healthier workplace. We are pleased to offer a smoke- free/tobacco-free environment for all patients, employees, volunteers and visitors.